Advanced processing in the GMA 350 adjusts audio in the headset to mimic how the human ear normally hears and registers sounds in space. 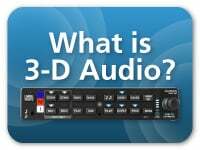 3-D Audio makes it seem like different audio sources are coming from different directions so you can easily distinguish one source from many. For example, COMM 1 will seem like it's coming from the left while COMM 2 will seem like it's coming from the right. The GMA 350 makes in-flight entertainment easy. Permanently wire 2 dedicated input sources into the rear connectors, such as an XM receiver and an auxiliary music device. Plug your portable audio devices (such as MP3 players or mobile phones) into the 3.5 mm jack on the front. Control which headset positions have access to which audio sources with the “blue-select” mode so your passengers can enjoy music while you listen to radio communications or make private full-duplex telephone calls. 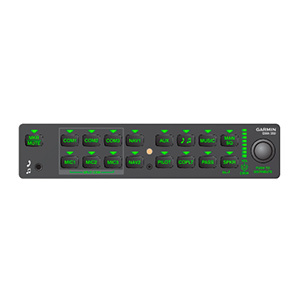 The intuitive front panel layout features cursor control and volume indicator for easy operation. Advanced auto squelch automatically adapts to a quiet or noisy cockpit without clipping words or cutting out in the middle of phrases. An internal microphone also senses ambient noise and adjusts the cockpit speaker volume level accordingly. The system analyzes ambient noise level and adjusts volumes for the headsets (when configured to do so at the time of installation), making alerts quieter when you're on the ground. 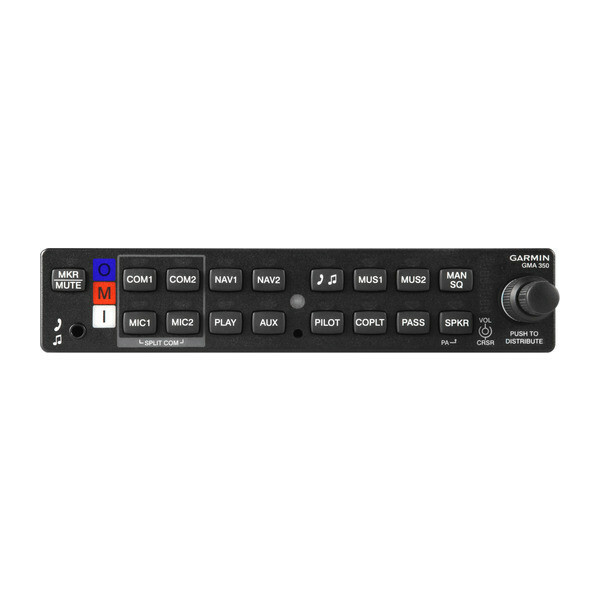 A split COMM mode lets the pilot and copilot broadcast on independent frequencies. The automatic digital voice recorder continuously captures the last 2.5 minutes of audio for playback, so you can go back and listen if you miss an ATC call or frequency assignment. 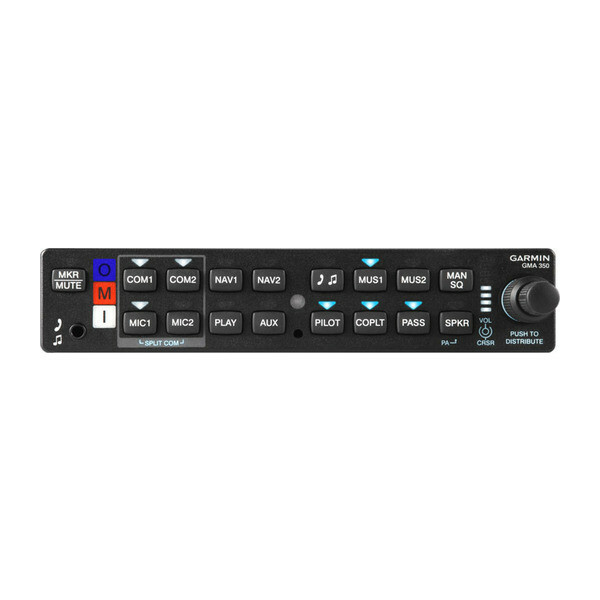 The GMA 350c offers all the technology of the GMA 350 audio panel and adds the convenience of Bluetooth® wireless connectivity with your mobile and compatible portable devices, so you can distribute music or telephone audio through your aircraft audio panel wirelessly. And, with the VIRB® XE Aviation Bundle, Bluetooth works in place of a headset audio cable to overlay cockpit audio, such as radio and intercom, onto your video. includes marker, AUX and speaker volume controls; also features 3D spatial audio and automatic speech recognition.